Protect your family and yourself from illness. Acquire a taste for healthy food. The best part is, this transformation of health doesn’t take months or years to perfect…and it doesn’t require you to give up foods you love, eat a bland diet, or starve yourself. The one change required to feel confident and revitalized is...Learning how to prepare mouth-watering meals that permanently improve your health. A 6-week course to optimal health, even if you don’t know the first thing about cooking! Becoming a healthy chef doesn’t mean eating raw vegetables, drinking liquid diets, or eliminating your favorite foods. This effortless training allows you make healthy eating fun and delicious. In only 6 weeks, you will discover how to prepare nutritious, vitamin-rich meals right in your own kitchen, even if you don’t know the first thing about cooking and don’t have time to learn. Make one simple change in your life, so that you lose weight and keep it off forever. Avoid and treat diseases that are caused by poor nutrition, so that you can manage or bypass diabetes, high blood pressure, high cholesterol, heart disease, and hypertension. Enjoy your new, healthier lifestyle without toiling away in the kitchen for hours or feeling as if you’re missing out on the foods you love most. Learn fundamental grocery shopping tips, so that you’re never at a loss for what to purchase at the store or farmer’s market. Discover easy-to-find and inexpensive herbs and spices that turn your nutritious dishes from bland to fantastic. Quickly and efficiently master healthy cooking with follow-along, video demonstrations on how to prepare soups, snacks, salads, and whole grains. Remove processed sugar and trans fat that keep you feeling tired and cranky and stop you from losing weight. I’m Dr. Daemon Jones, but my friends and patients call me “Dr. 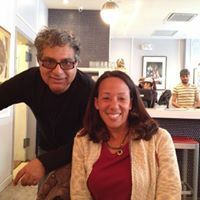 Dae.” I’m a doctor who helps her patients create a sustainable lifestyle transition and the author of Eat More Plants. I’ll tell you what no one else will…Your risk for disease and a shorter life has more to do with what you eat than genetics. Chances are, you’ve been told all your life to give up your favorite foods or that dieting is a “no pain/no gain” situation. I know exactly what you’re going through. After I graduated from Northwestern University, I joined one of the top 5 consulting firms in the country. It felt as if I never stopped working. After driving 1.5 hours every day and juggling multiplying responsibilities…I caved. Mental and physical exhaustion wiped me out, and I ended up eating fast food every day. My health became my last priority. Eventually, I had enough. Fed up with living unhappily and eating life-shortening food, I sought the help of a naturopathic doctor. She reversed my dangerous path and helped me transition to a more balanced life. Only when I placed my focus on my mental, emotional, spiritual, and physical well-being did I break free from the trap of stress and poor nutrition. People who sacrifice their health. Most diet crazes focus on what you can’t have and restrict your diet, so you end up feeling tired, cranky, and hungry. I designed this course for busy, health-conscious individuals who want to establish a new lifestyle. Become a “Healthy Chef” even if you’ve never cooked before. People who are ready to prepare nutritious meals at home rather than buying take-out. Experienced cooks who want to learn healthy cooking techniques that don’t skimp on taste. Families who want to learn how to cook together and transition into a healthy lifestyle. People diagnosed with diabetes, high blood pressure, or any diet-related illness who want to manage these diseases and lessen symptoms. Vegans and vegetarians who want to cook healthier meals and cut down on simple carbs that turn into sugar. Meat eaters who want to incorporate more plant-based meals or cook for a vegan/vegetarian spouse, friend, or loved one. I know how busy you are and how important your time is. Each week, I will send you a new video lesson and course material that will show you how to cook meals that you and your whole family will love. I’m not talking about the supermarket—discover the dietary staples that improve your health. Save time and ensure that cooking is always delicious and convenient. Week 3: Let’s Go Shopping! If you think healthy eating sounds bland, you’ll show your taste buds what nutrition is really all about. Portion size is paramount to healthy living—but it’s not what you think. This week, you’ll learn how much to put on your plate and how to eat 10 servings of fruits and vegetables a day. Be prepared and ensure your lifestyle transition is permanent. Nutrition is essential to leading a balanced, happier life. Even if you’ve never gone near a stove, or grocery shopping is a nightmare, it only takes 6 weeks to make this one change…And the results are nothing short of life-changing. See what clients have to say about Dr. Dae's program.